This fascinating hand colored 1818 map by Edinburgh cartographer John Pinkerton depicts Australia (as New Holland with Van Diemen's land no longer attached), New Zealand (depicts only two islands), and parts of Micronesia and Polynesia (nothing is in quite the right place). 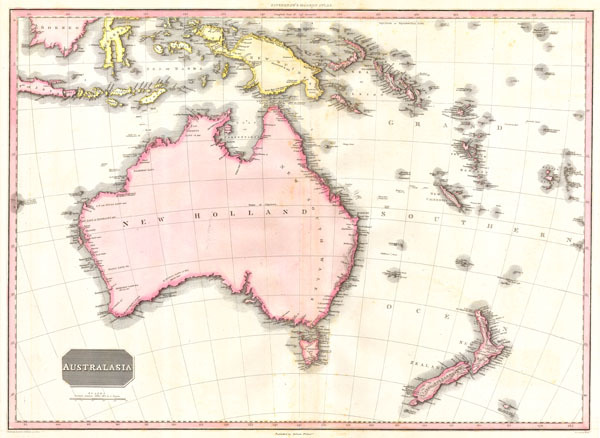 Without a doubt, one of the finest and most important maps of the Australia to appear in the 19th century. The map comes from the scarce American edition of Pinkerton's Modern Atlas, published by Dobson & Co. of Philadelphia in 1818.